Today marks the first day of school in many places around the world. I don't know how much you pay attention to news from other countries, but today began the first day of "glorious indoctrination and drill to the joy of our exalted leader" in North Korea. The Korean Central News Agency of DPRK, released the following photo of a happy classroom in Pyongyang leaving a recently constructed greenhouse. Western operatives have informed us that the class is currently studying Wind Turbine Technology, Pneumatics, DC and AC Circuit Design, as well as Semiconductor and Digital Physics. Where the Hermit Kingdom acquired such knowledge has baffled western observers. One unnamed source described the technological advances as progressing at a "Z-boom pace." My dad is on the roof, and he won't come down. He is yelling at the top of his lungs about a "nemesis" and "getting even" or something about an "embargo"...I think the neighbors are getting worried. They are gathering at the fence with lawn chairs and coolers. What should I do? I would suggest bringing him a cold drink and reminding him of how much you love him and how you'd never do anything like that horrible nemesis does and when he's got things in perspective, ask for a new car or a trip to Europe or something good. He is now making noises like a peacock, and flapping his arms. The neighbors appear engaged in some sort of wagering. Well, it was bound to happen sooner or later. Cherish the good memories and if he recovers feel free to ask for something even bigger. How did you take this photo and get out alive? CNN reports that the Korean dictator, an expert on North vs South struggles, claims that the acquisition of a large army of tractor-tanks will bring him the final victory, and confirm his status as gentleman leader. HMMM, a awful large head with out an sun shine on it on that little guy up front. Astrocrabpuff, this photo was released by the state news agency, so thankfully we lost no men in obtaining this one. Rob, when you put everything in perspective it is a little frightening. It seems like every week dictatorships have the ability to produce scary new mystery persons. Anon, I agree. Like the old USSR, North Korea and Iran have released large numbers of suspicious images. Sometimes these nations are jokingly called the Axis of Photoshop. While Iran tends to multiply their military capability through creative editing (e.g. 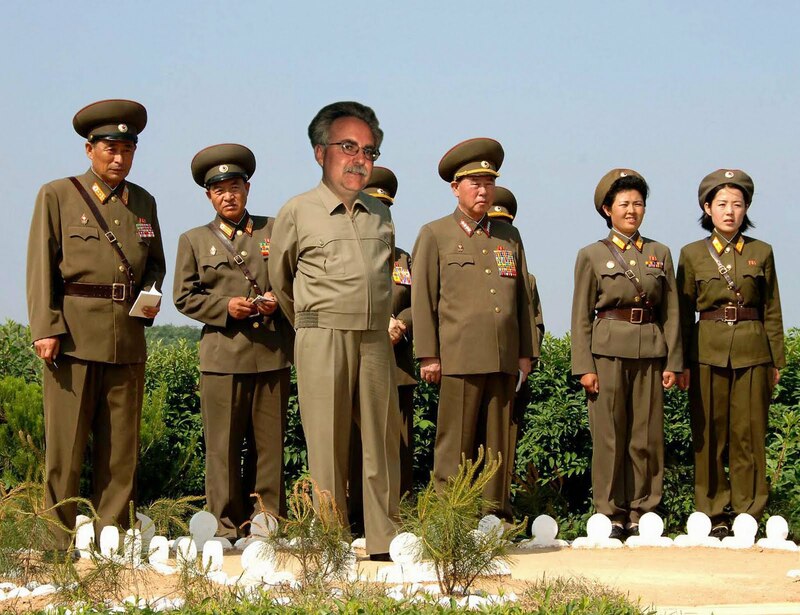 extra missiles), North Korea is in overdrive trying to show that their leader is alive and well (e.g. floating aides, green foliage in wintertime, disappearing and reappearing lines, funny tans, shadows that aren't congruent), etc. Regarding the large head, that is self-explanitory. You are correct, images like this are probably photoshopped, but that leaves the scary prospect that these Super Villains like those pictured may not be currently residing in North Korea. For all we know, they could have crossed our southern border and operating "fifth column" operations even within our own country!